These are both round (or at least round-ish) watches with a 42mm face. I'll get to the screens shortly, but the first thing to consider when comparing smart watches, and some might say the most important thing, is the design. 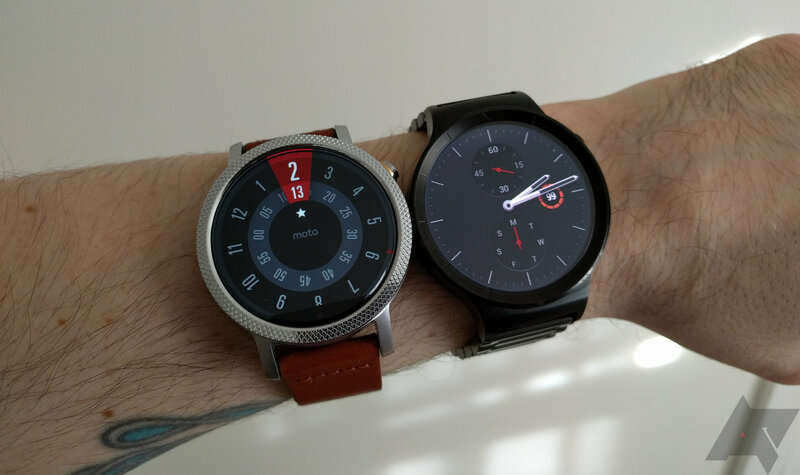 The Huawei Watch and Moto 360 v2 both go for a minimal bezel design that looks more like a real watch. A few other watches with round screens have a lot of mass outside the screen to house components. That makes the overall footprint of the device less comfortable. Compared to just about every other Wear device, these watches are both very comfortable. However, I think Motorola's lug design is better than Huawei's. You'll notice this mainly if you've got wrists that are on the small side. 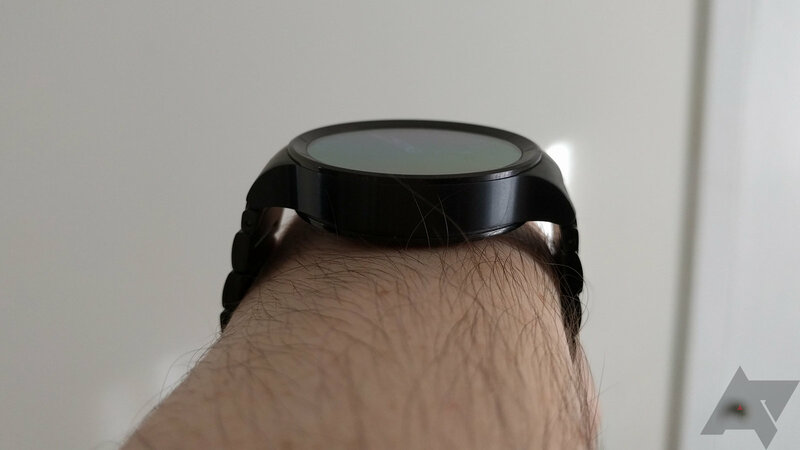 The lugs on the Moto 360 taper down from the body of the watch, and the band attaches very close to the round body of the watch. The Huawei Watch's lugs go straight out a few millimeters, and the band attachment is farther out. This leaves room between the lugs for a bit more internal stuff, like that inactive speaker. So what does that mean? Basically, the Moto 360 sits flat on your wrist, while there's some air between the Huawei Watch's lugs and your arm. See the pictures above for an example of what I mean. Again, anyone with a larger wrist will have fewer problems with the Huawei Watch here, but it's just a little more awkward. The bands themselves seem about the same to me, though I've only used the leather Hwatch briefly—my review unit has a metal link band (and I am actually not impressed with the quality). The Motorola band is high-quality Horweeen leather, but it's wax treated and will be a little stiffer at first compared to the genuine leather band on the Huawei Watch. The Motorola band should age better than the Huawei one, but I haven't used it long enough to know for sure. Motorola also offers some cool customization options for the 360 via Moto Maker. You can mix and match case colors, bezel colors, patterns, and bands. The Huawei Watch does come in a few different SKUs, but there's no customization. The black model Huawei also has analog tick marks around the display, which I really don't think is necessary for a smart watch. 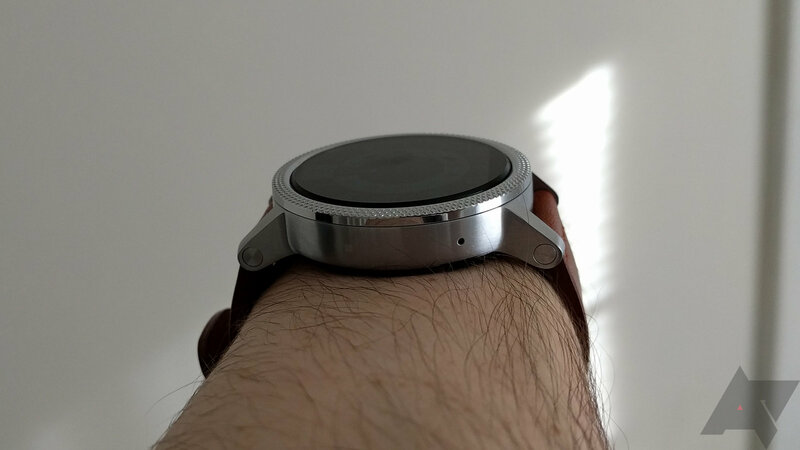 The Huawei Watch is also noticeably heavier than the Moto 360, and although it's technically a tenth of an inch thinner, the lug design makes it look thicker. Both these watches have the crown button in the 2 o'clock position because it stays out of the way in the event you bend your hand back farther than usual. The Moto 360 button is really just fantastic. It's solid and very tactile when you press it. There's also a tiny Motorola logo etched into it. The button on the Huawei Watch isn't bad, though. There's some tactility when you press, but it's somewhat mushier than the 360's button. 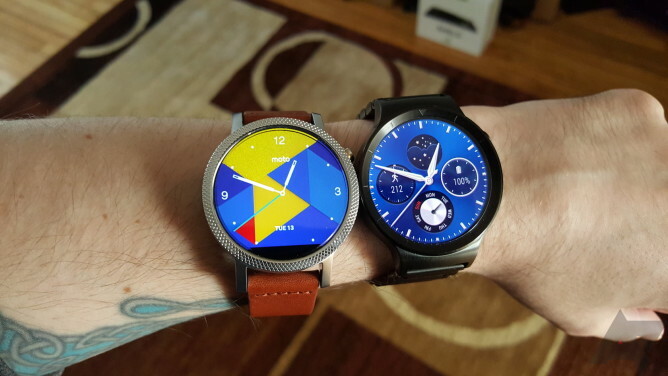 The screens are probably the most notable difference between the Moto 360 and Huawei Watch. Motorola again went with the flat tire LCD panel, which allows the Moto 360 to have almost no bezel and an ambient light sensor on the face. The black section at the bottom is where all the display drivers and electronics connect. Huawei, on the other hand, went with an AMOLED panel that is completely round. I won't bore you again explaining in detail why the 360's panel is a necessary annoyance, you can read the full review for that. Basically, it's lame, but it's a sort of lameness that you get used to. The 360 comes in two different screen sizes/resolutions, but my comparison is based on the smaller 42mm watch. The 46mm is 360x330 and the smaller one is 360x325. Ignoring the flat tire for a moment, it's a great LCD. The viewing angles are perfect and outdoor performance is better than the Hwatch. One indisputable advantage of the 360's screen is the ambient light sensor. The 360 adjusts display brightness throughout the day, but with the Huawei Watch you have to get into the settings and change the brightness whenever you go outside. Or at least you should if you want to be able to read the display and still get decent battery life indoors. The Huawei Watch is not without its strong points. Firstly, it's round. Like, completely round without an annoying chunk missing from the bottom. It's also higher resolution at 400x400, and the colors and black levels are superior to the Moto 360 because it's AMOLED. I do worry about burn-in with this panel, but Android Wear does have some burn-in prevention tweaks. 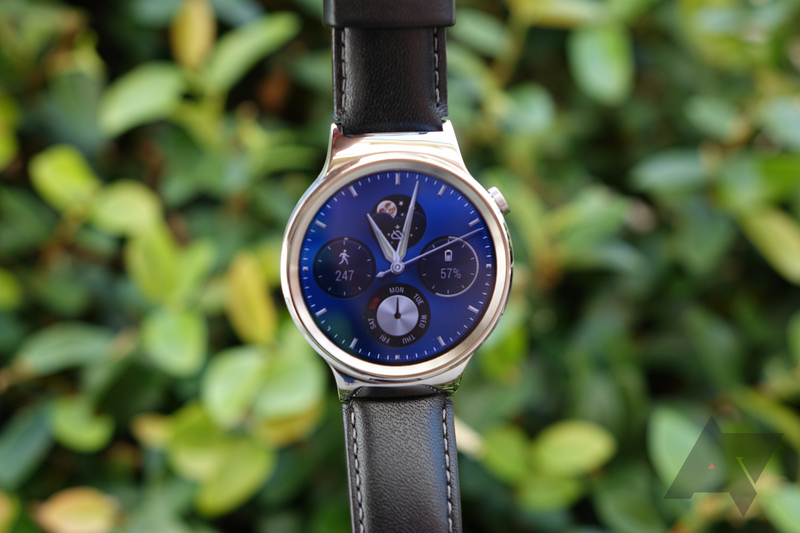 The Huawei Watch looks great in ambient mode, thanks largely to those deep AMOLED blacks. It also doesn't downshift into low-quality mode like the Moto 360 does. At normal viewing distances it isn't a huge deal, but you can see some jagged lines on the 360 due to the lack of antialiasing. 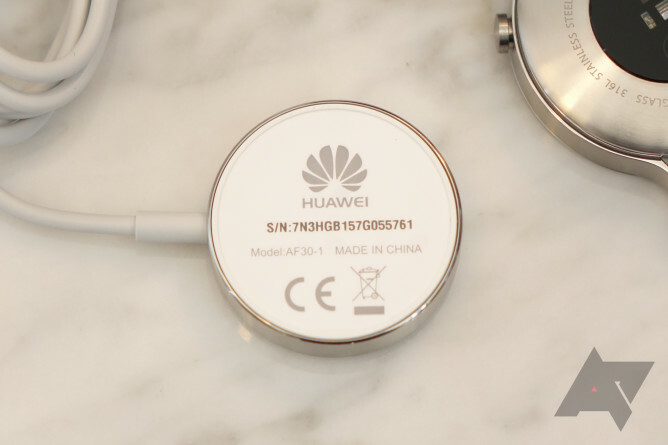 The Huawei Watch has a 300mAh battery, which is the same size as the 42mm Moto 360. The larger 360 has a 400mAh battery, but we're mainly looking at the smaller one as it's more comparable to the Huawei Watch. Just know it's possible to get a few extra hours out of the larger Moto 360 . The battery life has been very similar in my testing. With moderate use, both watches lose 3.5-4% per hour. Keep in mind, I leave all the default settings on for this testing. The Moto 360 is good for about 24 hours with a dozen apps installed. The Huawei Watch makes it a few hours longer most days, which I think has something to do with my preference for black watch faces that don't use as much power on AMOLED. Neither watch has a clear victory here as they're both good enough for a single day of usage, but far short of eking out a second day. You'll charge them both every night. When the time comes to charge, the Moto 360 uses wireless Qi, and the stand is rad. It holds the watch up so you can still see the time, and it works on other Qi pads too. The Hwatch's pogo pin charging plate is awkward and hard to get lined up. I'm constantly sticking it on the back of the watch, following the pull of the magnet, only to learn later that the pins weren't quite lined up and it didn't charge. Ugh. Both these watches run Android Wear and the experience is virtually identical. 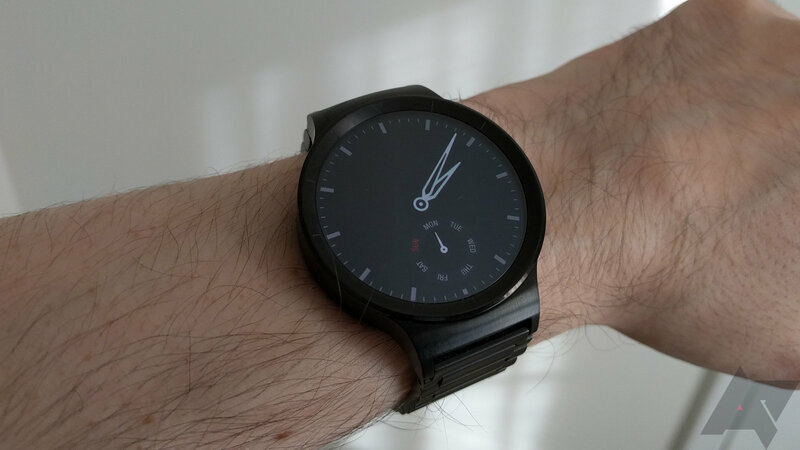 My only note with regard to how Wear works is that the Huawei Watch seems slightly more responsive. It's not the sort of thing you're likely to notice unless you have both devices in front of you to test. Google has the OK Google command built into everything these days, and that includes Android Wear. There's an odd thing with all the new Android Wear devices I've tested in that they don't seem as sensitive to the command as past ones. Both the Moto 360 and Hwatch require a bit more volume than I'm used to using. It works fine once the command is triggered (or you open voice command manually), but the hotword is finicky. Another feature I use often is wrist gestures, which is on by default on both watches. I feel like this feature is underappreciated. With just a tilt of your wrist, you can scroll through cards to see what's up. The Moto 360 works flawlessly. Just a little twist and it scrolls instantly. The Hwatch has some sort of issue with accelerometer polling because it takes ages for it to respond to this gesture, and when it does, it happens about a second later. That brings us to watch faces. This is where OEMs really get to make their mark on Android Wear, and Huawei came out swinging with two dozen custom watch faces. A lot of them look nice, but some are too cluttered and don't offer much in the way of useful information. Huawei insists on using dial complications that point to the day of the week. Why? That's not a good use of space when you can just use a letter or word. The bigger problem is that Huawei's watch faces aren't customizable and they lack support for active touch targets. On the other side, Motorola's watch faces are more thoughtful and feature-packed. You can change what the complications show, pick different themes and accent colors, and even use buttons that display additional information. From a purely aesthetic (and personal) perspective, Motorola's watch faces appeal more to me because most of them look modern and realistic without aping a traditional watch design. If you think the slightly longer lugs and band placement on the Huawei Watch will work with your wrist, then it's probably a better watch. That is, of course, assuming you like the design. 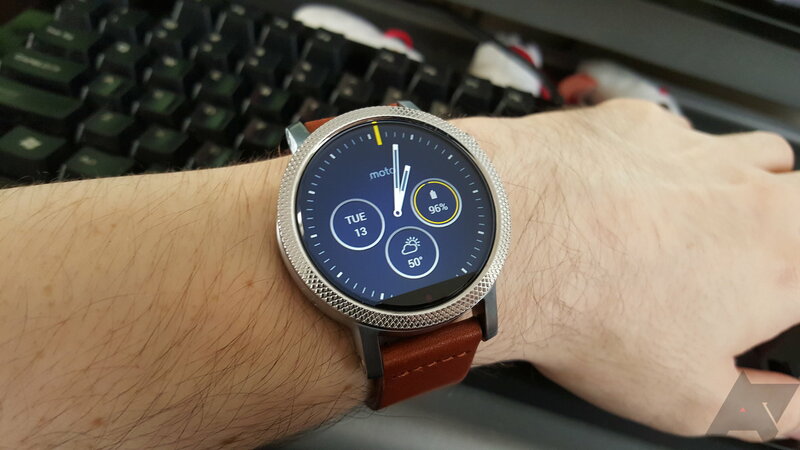 It looks nice in my opinion, but I'm personally more into the Moto 360 with the knurl bezel pattern. The fully round screen on the Hwatch is definitely more desirable as it can save battery life on black backgrounds and there's no flat tire. That said, I don't think the Moto 360's screen is a deal breaker. It has plenty of other fine points. For example, the watch faces, which are great. The Huawei Watch starts at $350 for the basic silver version with black leather. I think that's the one to get if you're going that route. You can swap out the band with something else if you don't like it, but be aware there's a little notch that narrows the stock band at the connection point. That means replacement bands will have to be narrower to fit. The $300 42mm Moto 360 is also a very compelling option, but it's not cheap enough that the cost alone should sway you. However, you can customize it and get a flashy watch for far less than the gold Huawei Watch.